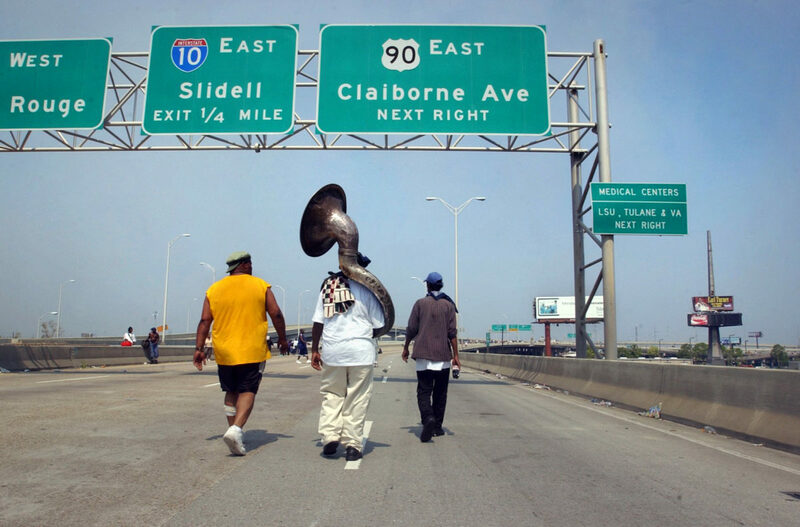 Mark Smith, middle, walks toward an area where he's going to camp out carrying along his sousaphone on the interstate next to the Superdome in New Orleans on September 2, 2005. "If I leave this I might as well jump in the water myself," he said of his instrument. "This is my livelihood." Mark 'Tuba' Smith plays in second line with the Free Agents Brass Band during a wedding in Gretna Louisiana on August 19, 2006. 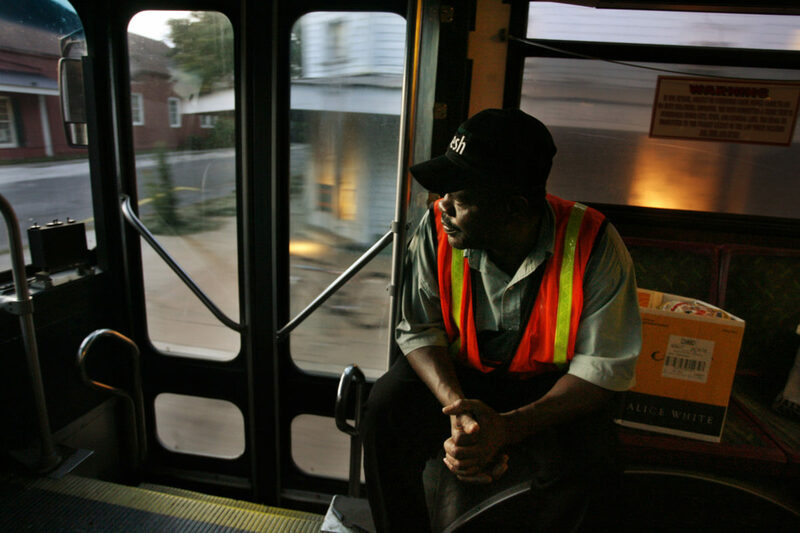 Mark Smith takes the bus home on Magazine Street after working at Save-A-Center where he cleans floors and bagging groceries on Carrolton Ave in New Orleans on August 18, 2006. While Hurricane Katrina was devastating for Mark and the city, he tries to see it as a new beginning. He feels like he is now more focused and responsible in his life. Rent has soared in New Orleans, and Mark cant afford it. But he doesnt want to live anywhere else. 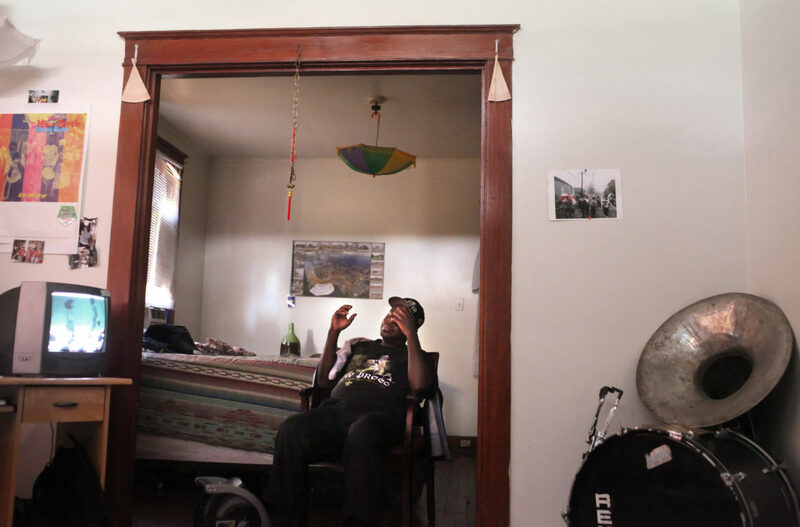 I love my home, I love my life, I love my city, he said. 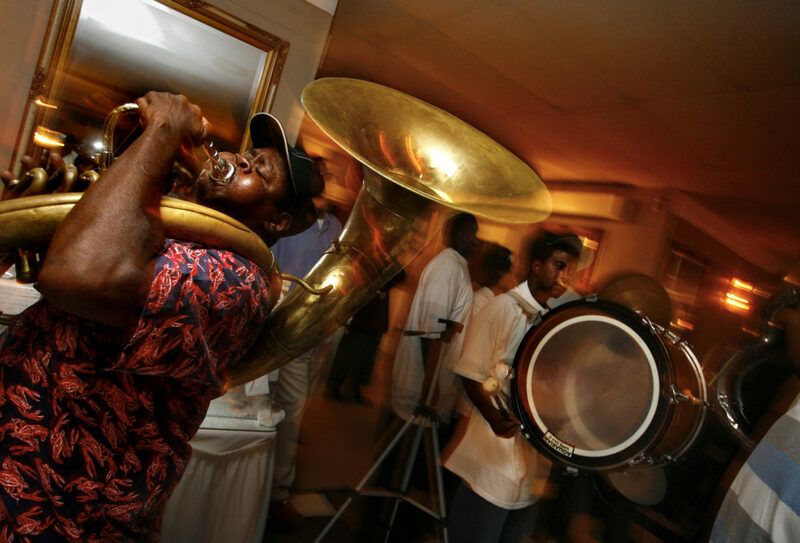 Mark "Tuba" Smith rests at a friend's home after a day playing music for tips in the French Quarter in New Orleans on August 22, 2010. Hes been playing since he was a kid in the Magnolia projects in New Orleans. When he left New Orleans  walking along the interstate next to the Superdome,  his battered sousaphone was one of the few things he carried. If I leave this, he said, I might as well jump in the water myself. He ended up in an apartment in Dallas with relatives. He got a used sousaphone, through the Grammy Foundations MusiCares program. By the time he got back to New Orleans in February of 2006, he weighed over 300 pounds and was nearly diabetic. He said he has lost most of the weight. Looking south through the rubble from DIberville over the Back Bay of Biloxi to Biloxi, is the Imperial Palace, a casino which opened the previous week for the first time since Hurricane Katrina destroyed much of the town. Photo made on December 23, 2005. Children jump on a trampoline in Waveland Mississippi on February 20, 2006. Hurricane Katrina hit just a few miles from Waveland six months before. 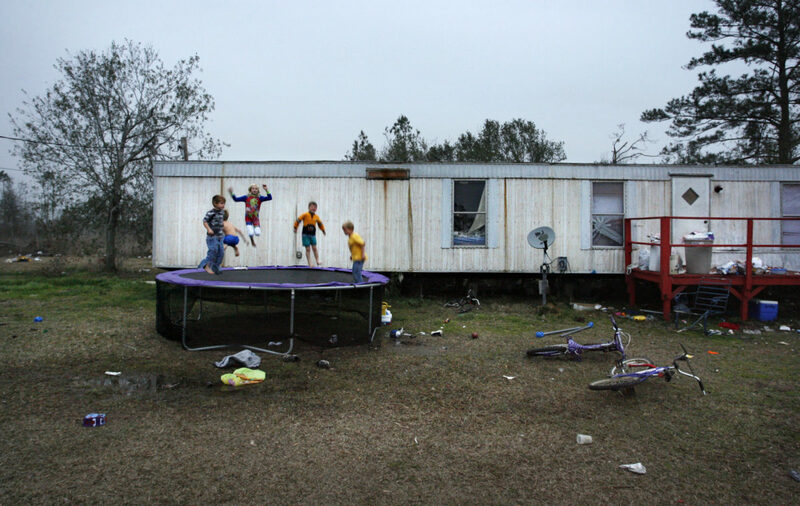 In the days after Katrina, one of the boys slept on the trampoline with his dad. Della Dullworth took it all in stride. Her family of five had lost their home in Waveland to Katrina, and now they were living in a tiny FEMA trailer. On this day, Cody Winningham, her 6-year-old, sliced open his foot while running barefoot outside. The trailer was so tightly packed with their few possessions that Della couldn't find the hydrogen peroxide. Despite the chaos, Della didn't panic. As the boy's father mopped the blood, Della comforted Cody and cleaned his wound. Moments later, the trailer was calm again, and she was laughing. Brandi Charles, 12, right, and her sister Bariah, 10, lay on a bed in their FEMA trailer after a Mardi Gras parade in Waveland. 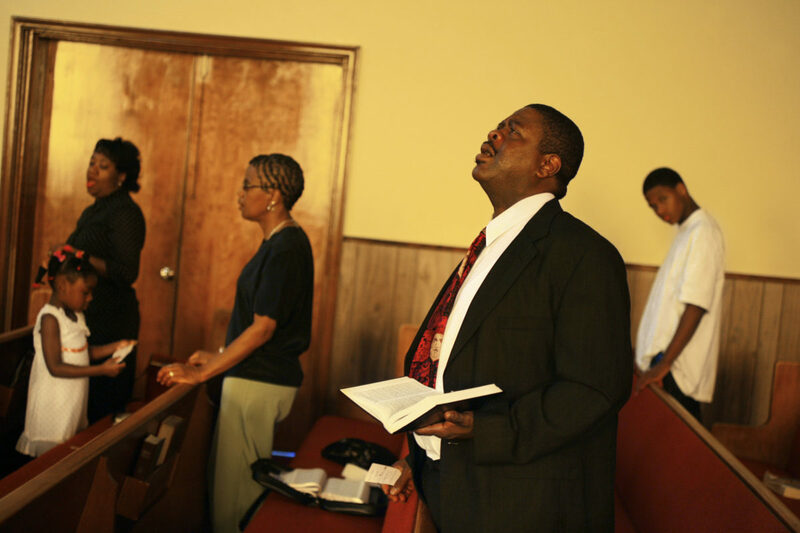 Volunteers from out-of-state churches made up nearly half the congregation at Lakeshore Baptist Church, a short drive from the Mississippi coast near Waveland on Sunday, February 19, 2006. 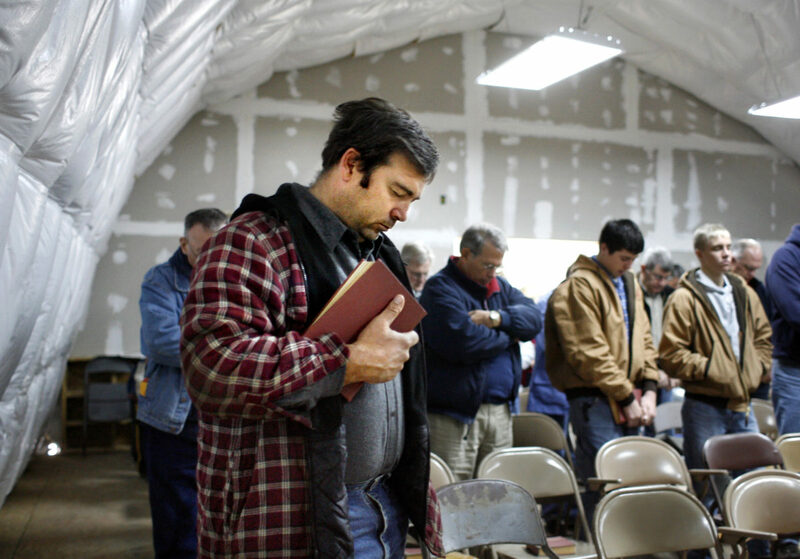 The church, destroyed during Katrina, held services in a Quonset hut. Its old white steeple sat propped up outside. The floors of the sanctuary were plywood sheets that said "This Side Down." Metal folding chairs, borrowed from another church, served as pews. On a table in the entryway lay stacks of fliers and booklets. One was titled Rain: The Great Work of God. 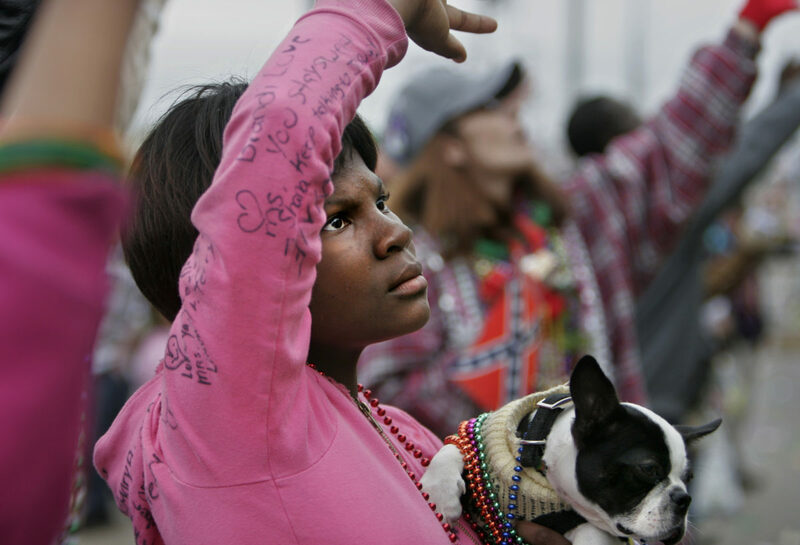 Brandi Charles, 12, holds her dog, Prince, during a Mardi Gras parade in Waveland Mississippi in February 2006. 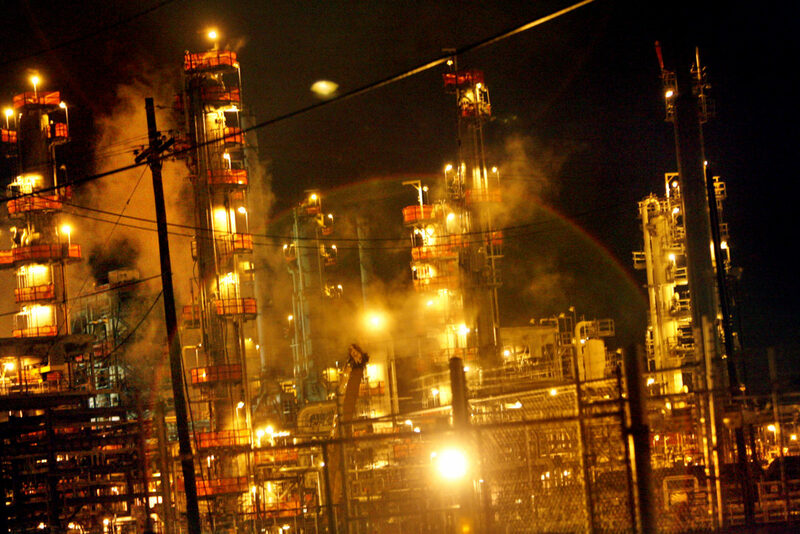 An oil refinery in Texas lights up the night sky. 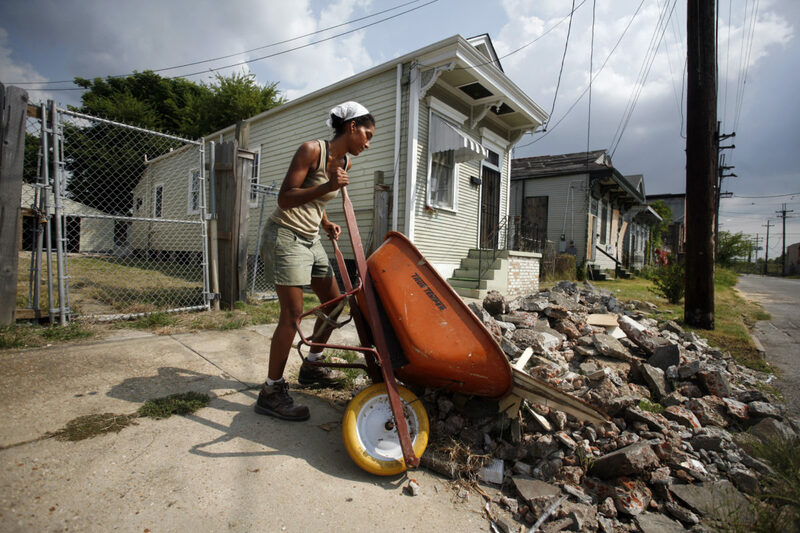 Jenga Mwendo dumps a load of debris from working on her house on Maurice Street in the Lower 9th Ward to the front yard after a day of working on the home by herself on August 8, 2007. She has learned about house construction after volunteering with the St. Bernard Project and works on her house by herself most every day. She has had groups of volunteers help along the way. Jenga quit her job in New York to move to New Orleans where she is living on savings, renting an apartment where she lives with her daughter and mother until they both finish their homes in the lower 9. 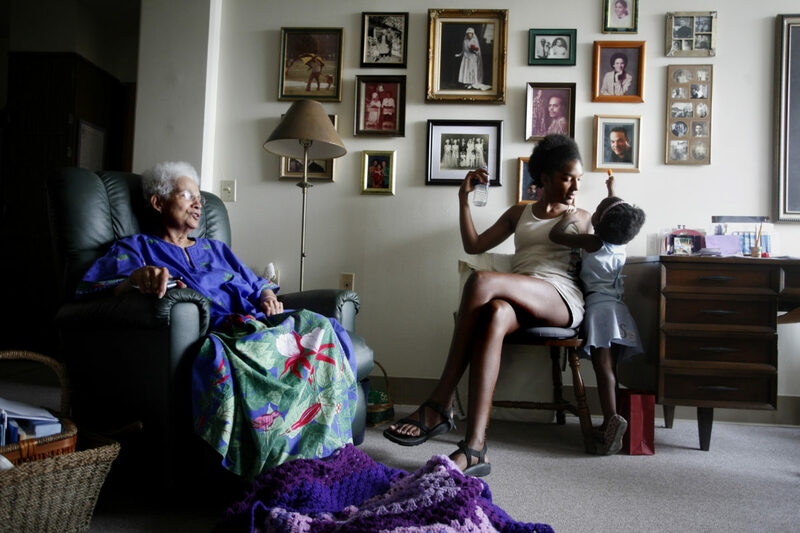 Azana Olusola, 3, points out a photo of her grandmother on the wall to her mother Jenga Mwendo while visiting Jenga's grandmother Aline St. Julien at her assisted living facility in New Orleans on August 14, 2007. Jenga's family goes back for generations in New Orleans. (Tampa 8/2007) Jenga Mwendo walks with her daughter Azana Olusola, 3, up to the levee wall at the Industrial canal where it meets the river in the Lower 9th Ward in New Orleans on August 7, 2007. 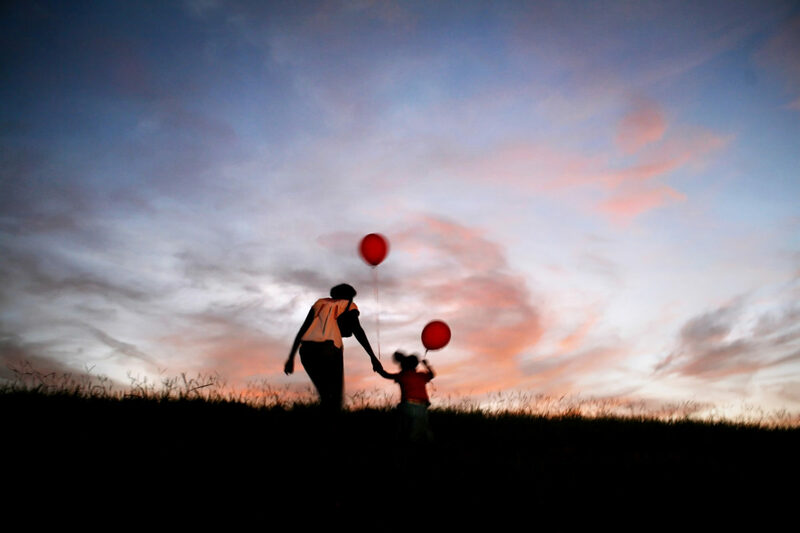 The two had attended several night out on crime events, one of which was next to the levee and is where Azana received her balloons. Jenga, 28, moved away from New Orleans after graduating from high school to attend NYU and worked in New York since then. Just before Katrina she bought a house in the Lower 9th Ward but had thought she would rent it out and maybe down the road possibly move down. After the storm she decided to quit her job and dedicate herself to living in New Orleans. She said she wants Azana to experience the music and culture of the place she grew up. 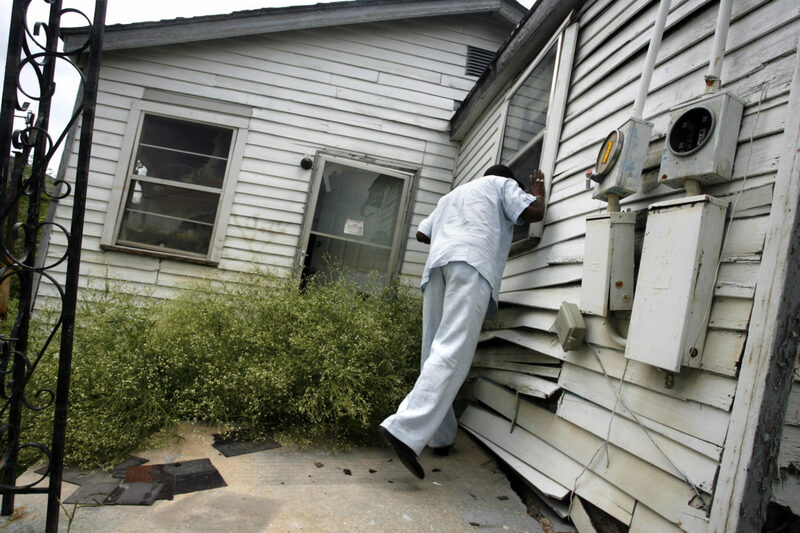 Morris Mayfield Jr. looks in his fathers devastated home in the Lower Ninth Ward on August 22, 2006. Terrell Batiste plays trumpet for the Hot 8 Brass Band. 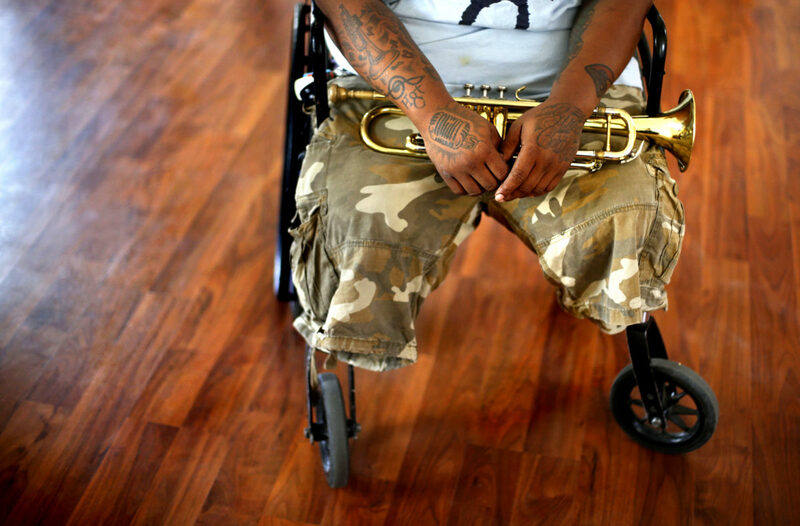 After Hurricane Katrina he evacuated to Atlanta and eight months later while in Atlanta he lost his legs in an car accident. He was struck by a car while changing a tire on the side of the interstate. Since then he has returned to New Orleans, performs with his band, and recently became the owner of a house in Musician's Village in the lower 9th Ward. 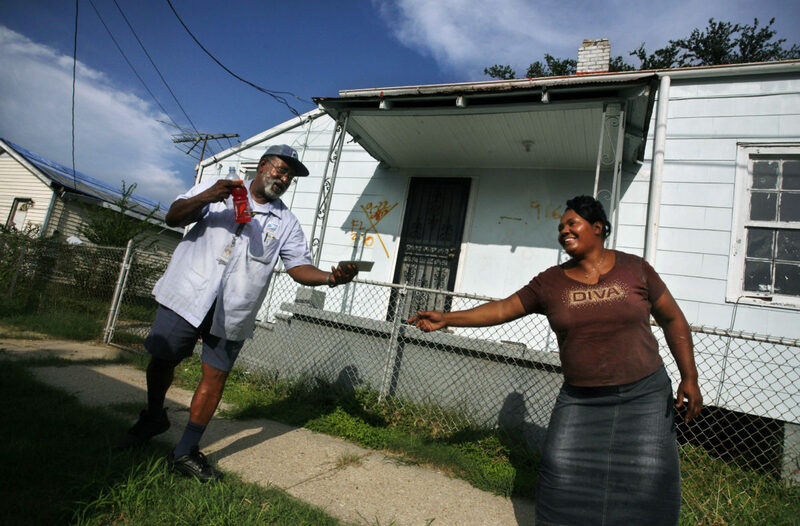 Postal worker Charles McCann takes a letter from Pastor Flora Washington in the Lower Ninth Ward on August 7, 2007. McCann has been a mail carrier in the Lower 9th Ward for 26 years. "I really didn't think a lot of people would come back and rebuild but they surprised me," he said. The demographers said mail deliveries in the city reached 66 percent of what they were before Hurricane Katrina by 2007. That's up from 50 percent from the previous year, which is up from zero just after the storm. 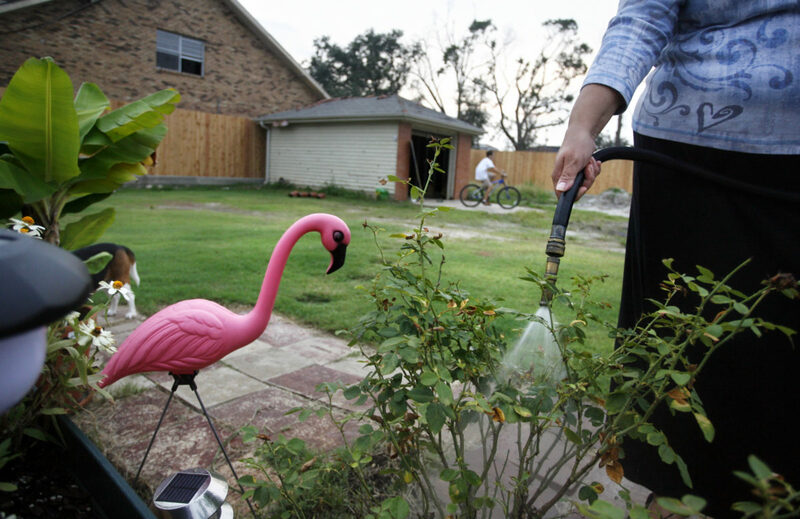 Stephanie Crescioni waters the plants outside their trailer in the Lakeview section of New Orleans on August 20, 2006. She and her family bought a trailer and moved back to the neighborhood on March 10 after three months of arguing with FEMA. "I washed my hands of the government," said her husband Wayne Crescioni, 52, a New Orleans police officer who hadn't left Katrina-ravaged soil since before the storm. "I said we're on our own if we're going to do it. We're here by choice and we're moving forward with our own future and our children's future." During the body-recovery phase after the storm, the 25-year police veteran was assigned to his own community, finding 10 neighbors dead in their homes. 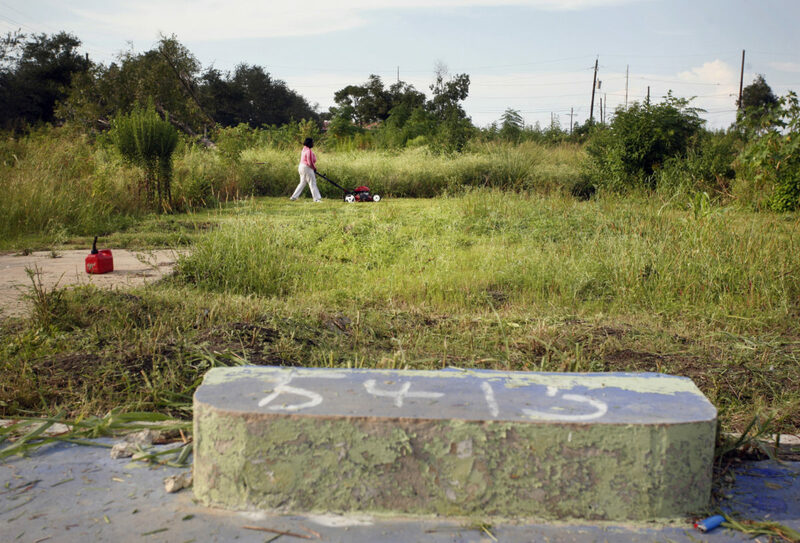 Eight years after Katrina: two neighborhoods pulled between memorializing the past and envisioning the future. 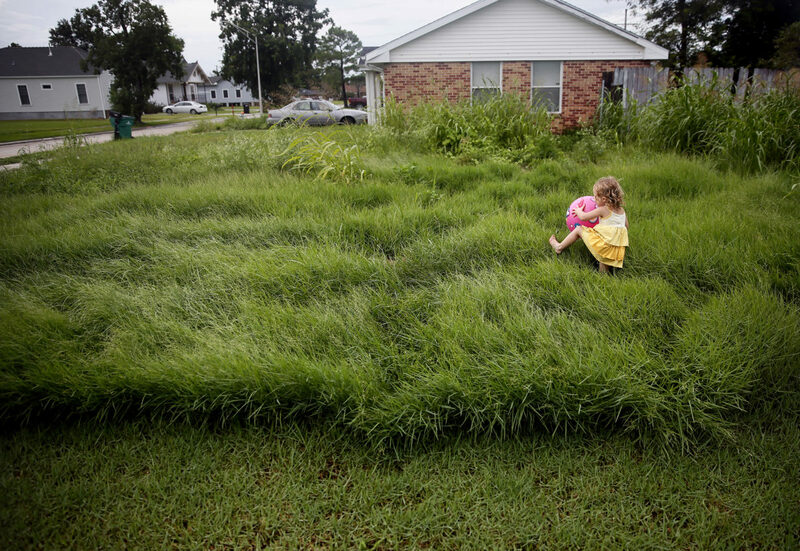 Caylee Hall, 2, plays in an overgrown lot two lots down from her house on Schnell Drive in Arabi on Sunday August 25, 2013. Her father Chris Bouffine Jr was watching her play with her uncle Patrick Bouffine. Chris said the lawn next to his stays cut by either himself or a company that comes in once a month. He likes to keep that section cut so Caylee can play there. Still, she likes the overgrown lot furthest away. Chris said his family is still very much struggling since Katrina. His father was working on rebuilding his home, saying it was about 75% finished, with permits, when the Parrish tore it down. Meanwhile there are abandoned homes on his street that haven't been touched. 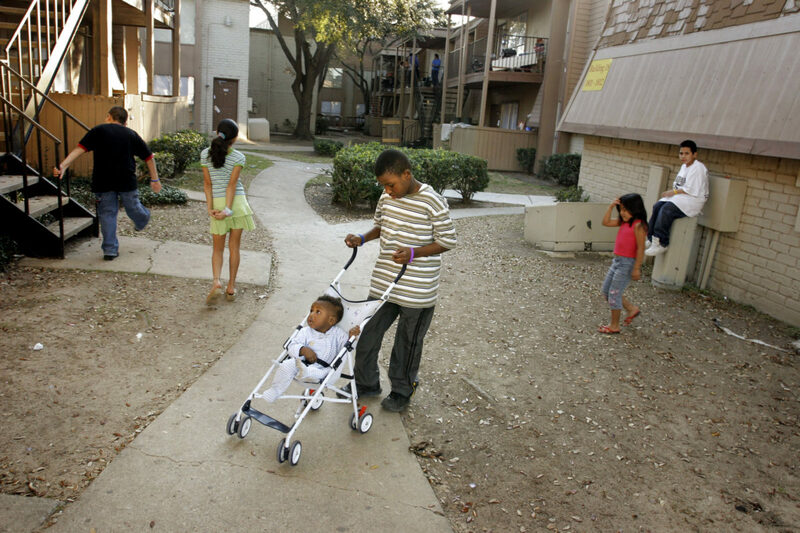 Travis Alexis, 10, takes his brother for a walk in the Rama apartment complex in Houston on Mardi Gras day, February 28, 2006. Before Katrina the complex was mostly made up of Hispanics. Travis and most of the New Orleanians in the complex had never been around Latinos before. New Orleans had been a city of distinctive but not ethnically diverse people, many of whom had spent their whole lives there. Evacuees in the Rama complex now had an Indian landlord and neighbors from Mexico and El Salvador. Like any immigrant community, the Louisiana evacuees were losing their definition in the roiling tide of the big city. 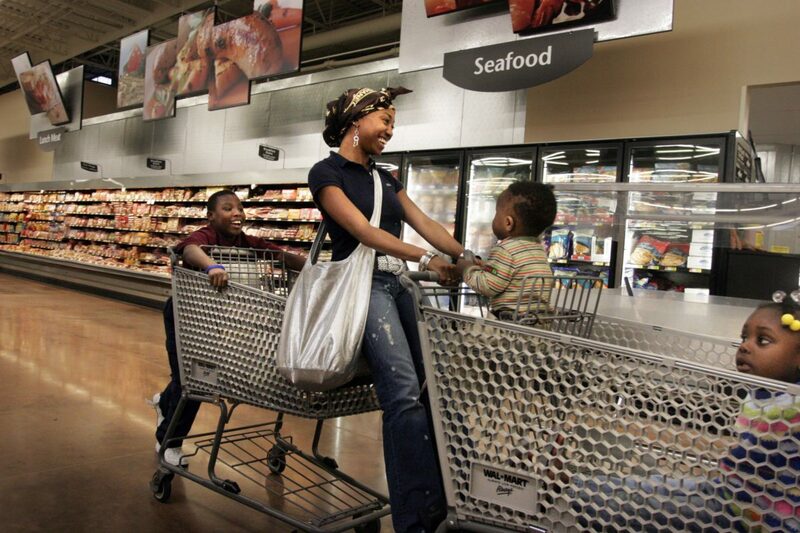 Travis Alexis, 10, his aunt Consuela Alexis, 21, middle, his brother Shawn Kerry Bradley, and his sister Treviyan Alexis, 3, right, roll through the aisle at Walmart in Houston looking for Mardi Gras dinner on February 18, 2006. They were shopping along with their mother and Consuela's sister Nicole. 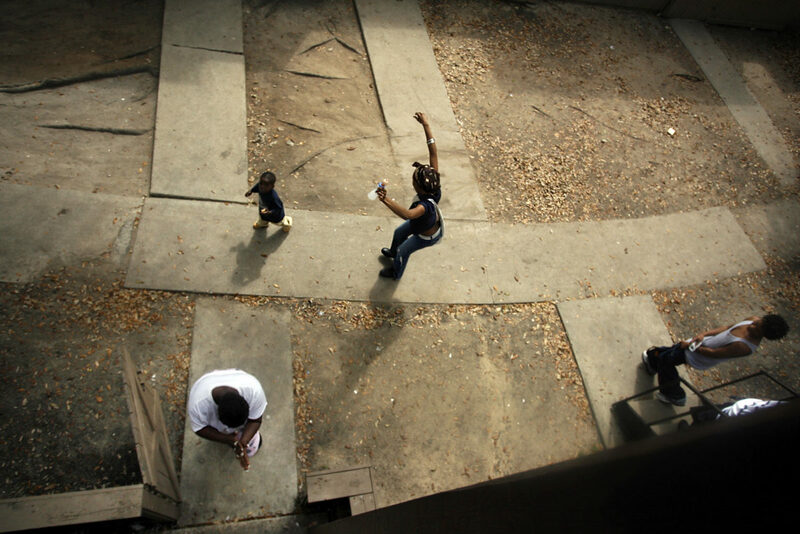 New Orleans evacuees dance in the common ground at an apartment complex in Houston on Mardi Gras Day 2006. 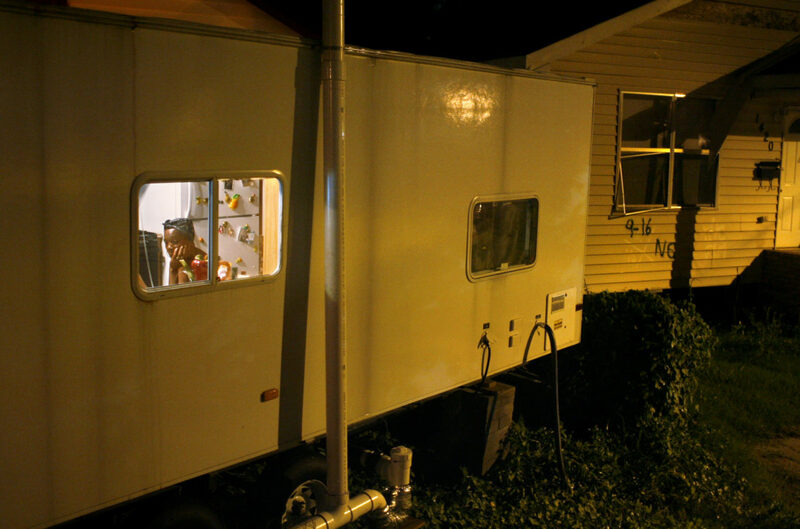 Shelia Rainey lives in a FEMA trailer in the Ninth Ward in New Orleans in 2006. 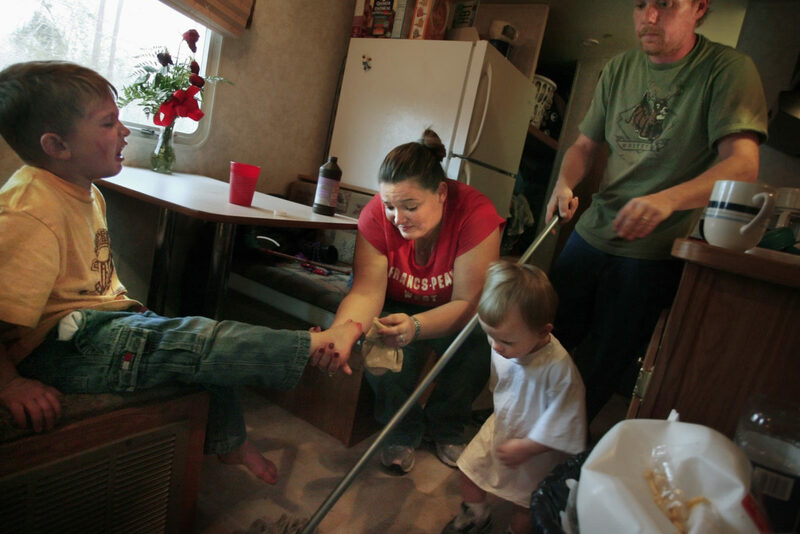 Rainey, a former day care worker, spent four days on the roof surrounded by flood waters. Today, she and her grandson Darryl, 6, are living in a trailer pulled up to Rainey's sister-in-law's home on Tupelo Street, a half-mile from the house Rainey's grandfather built two generations ago at 2006 Benton St. "I had to come back," she says. "I know how hard my mother worked on that house. New Orleans is my home." The U.S. Census Bureau says 77 percent of New Orleans regional residents are Louisiana natives, far exceeding other Southern cities. Rainey never considered living anywhere else. 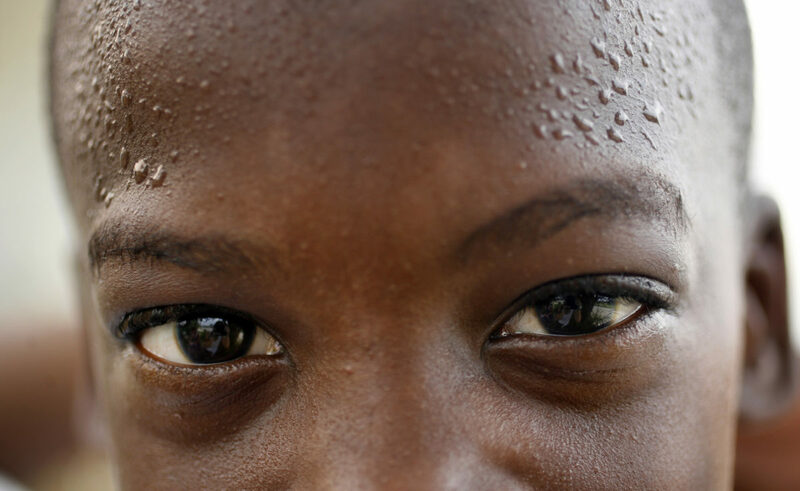 Darryl Rainey, 6, lives with his grandmother Shelia Rainey in the Ninth Ward of New Orleans. 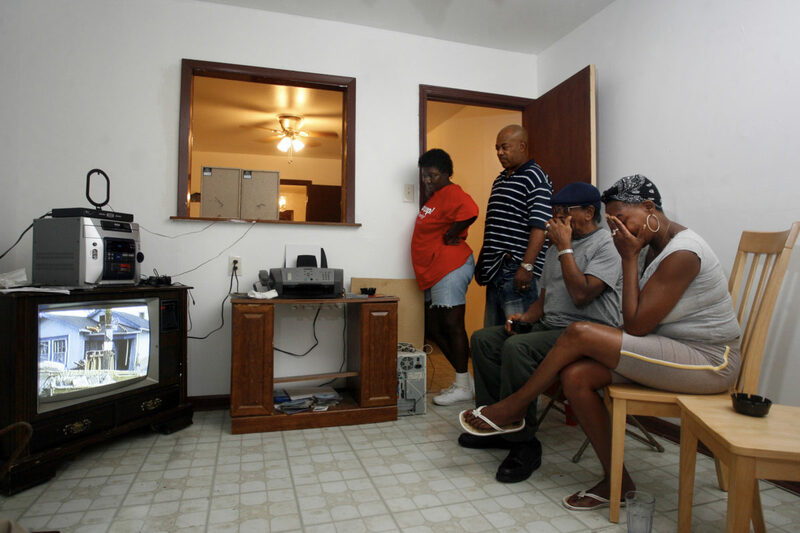 Shelia Rainey reacts while watching the Spike Lee Hurricane Katrina documentary "When the Levees Broke: A Requiem in Four Acts," at Janelle Dejean's home in the Lower Ninth Ward. Janelle stands at left, her fiancee Gardin Rainey next to her and sitting next to Shelia is her boyfriend Richard Thompson. Their home is the only one restored and livable on their block. Janelle fulfilled her goal of moving back into her home by June 1st. Elesha Spiller mows her lawn at 5415 N Rocheblave in the Lower Ninth Ward on August 6, 2007. She, her husband and their two sons moved back to New Orleans from Houston in November. "We're trying to come home," she said. But the couple says they are waiting for neighbors to start moving back. Regardless they try to keep the grass cut low. 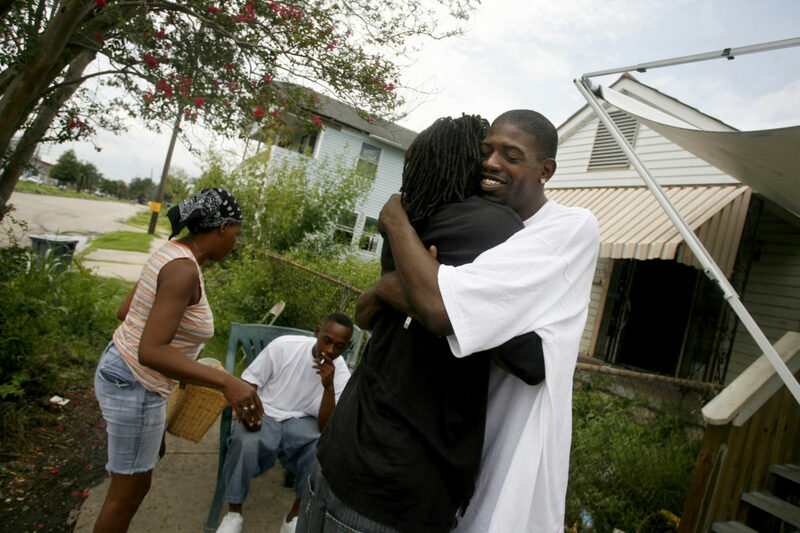 Ryan Hill, hugs Tarrell Rainey, right, outside the Rainey FEMA trailer on August 24, 2006. Tarrell and Ryan hadn't seen each other since they both were at the Reliant Center in Houston after Hurricane Katrina forced them to evacuate New Orleans. Tarrell said they grew up together in the Lower Ninth. "We were so happy to see each other," he said. 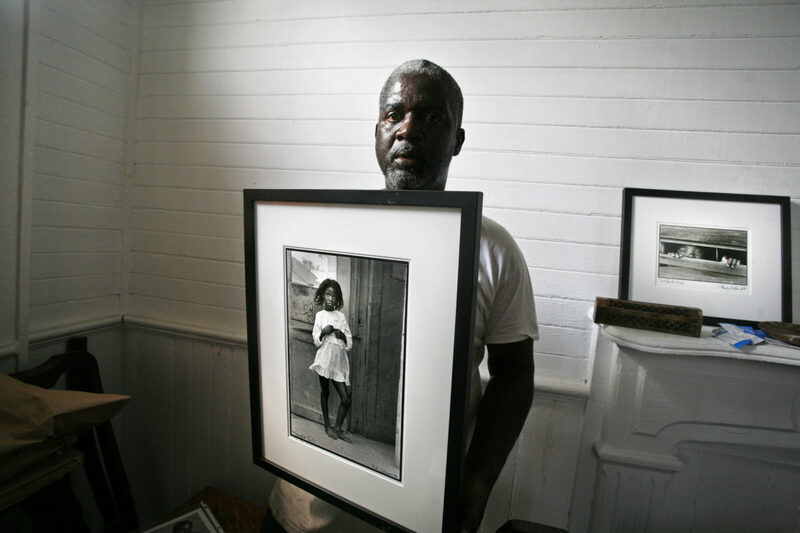 Ninth Ward photographer Keith Calhoun holds a portrait he made in his neighborhood years ago on August 6, 2007. 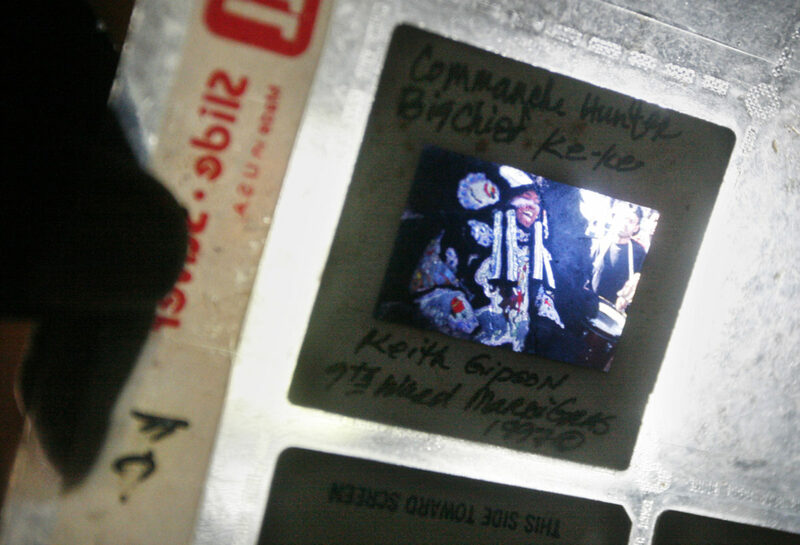 Keith Calhoun holds up a slide he recovered from the flood waters of the Mardi Gras Indians to the light. 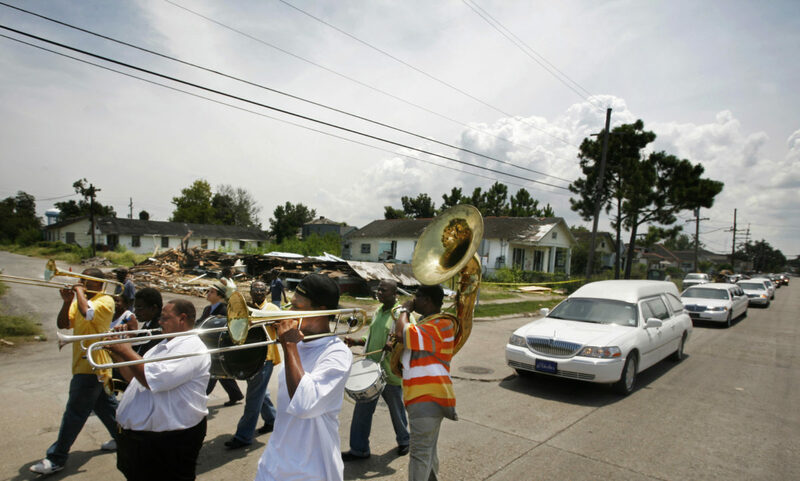 The Treme Brass Band leads a hearse carrying the body of Oliver Morgan from through the Lower Ninth Ward on August 7, 2007. Hurricane Katrina destroyed Morgan's home in the Lower Ninth and he had been living in Atlanta with his wife Sylvia Bailey Morgan since then. Hurricane Katrina made landfall in Mississippi on August 29, 2005. Levee breaches in New Orleans led to massive flooding, and government response was slow. Hundreds of thousands of people in Louisiana, Mississippi and Alabama were displaced from their homes, and there were 1,836 fatalities, primarily from Louisiana (1,577) and Mississippi (238). 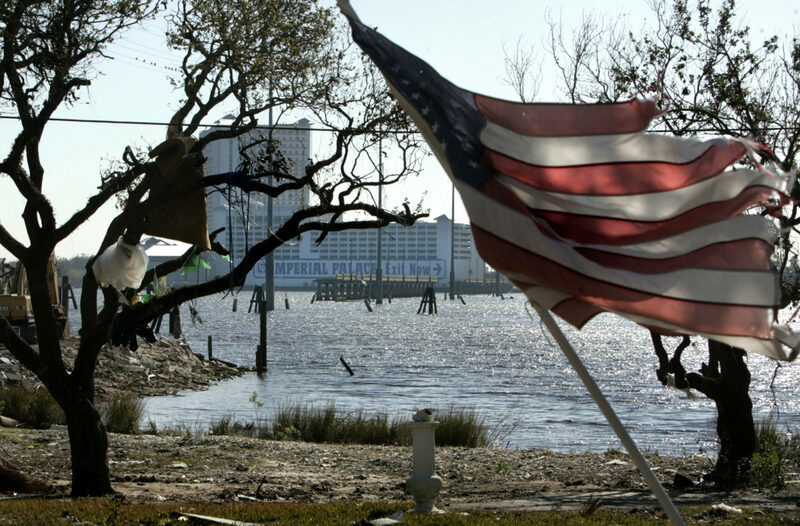 It was the costliest natural disaster and one of the five deadliest hurricanes in the history of the United States. Levee failure in New Orleans lead to the majority of the death and destruction. Eighty percent of the city and large swaths of nearby parishes were flooded. What’s more is that the disaster brought to the world’s attention a population that had for years been neglected. Many who were abandoned for days, desperate and stranded in New Orleans, came from lineages which descended in decades of poverty, discrimination and were deprived of economic opportunities.